AT&T and Palm Inc. officially announced the upcoming launch of the Pre Plus and Pixi Plus on AT&T Wireless this morning. While no specific date was mentioned aside from "the coming months", pricing and device specifics were thankfully discussed in the initial press release. For starters, the Pre Plus will retail for $149.99 after the usual $100 mail-in rebate and 2yr contract. The Pixi Plus will ring in at $49.99 under the same terms. Both devices will be full UMTS/HSDPA/GSM/EDGE compatible but otherwise offer identical hardware to their slightly older Verizon siblings. The only hardware change of note is that a blue Touchstone back available for the Pixi Plus. The new devices otherwise look identical to the existing "Plus" variants. 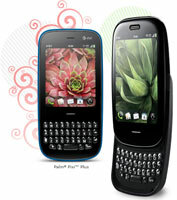 However, four exclusive AT&T-only software enhancements differentiate these WebOS devices from their CDMA predecessors. First of all, Palm's new AT&T releases trade off the Verizon-exclusive (and costly) wi-fi Hotspot feature in exchange for free wi-fi connectivity and automatic hand-offs at over 20,000 AT&T wi-fi hotspots nationwide. For navigation needs, an AT&T Navigator app will be available for turn-by-turn direction for an unspecified monthly fee. Additional AT&T-exclusive software tweaks include the AT&T Address Book to synchronize online contacts to the users' device and YPMobile for local Yellow Pages business search. Today's announcement represents the first new Palm products officially available on AT&T with full carrier subsidies and support since the glacier white AT&T Centro of February 2008 and the electric blue Centro of July 2008. You may remember last year when the oddity of a retailer-subsidized, unbranded AT&T "compatible" version of the Treo Pro was available exclusively through Best Buy Mobile retail locations. Palm Pre Plus and Palm Pixi Plus will be available in AT&T stores and online at wireless.att.com in the coming months for $149.99 and $49.99, respectively, with a two-year service agreement and after a $100 mail-in rebate. AT&T already has a webOS-specific page on their website where interested users can sign up for an email reminder when the devices become available. The full text of the press release is available here. I know who is getting my money when my contract expires. really? why would you buy into a dead platform? serious question. Eh long time. Nice to see your choices as well. Supporting Palm keeps North American pioneering innovation a choice. They can only get better. What do you think about Palm offering a Palm Classic device? It's still not a Palm. Lego! Welcome home long lost son. I'll be in line with you that morning to get one. I almost pulled the trigger on the Aussie version for ATT. Glad I waited yet another while. Pretty pumped about the WiFi hotspot going for free. That is going to be really handy for me on the road. The turn by turn, I'll forego for the cost, since I already have a TT 740 GPS. Quit kicking against the goads my reptilian friend. It's synergy time baby! Would you please just get rid of that turn of the century toy phone and step into the tens with us. I think the App Catalog has an app to let you resume your trusty Pilot 1000 alarms and 1k clipboard on WebOS. That should be the final hurdle to get you over to the Pre. Besides, when you upgrade to WebOS, you're reputation alone will cause the stock to bounce and the juggernaut will most likely begin. Note: Fondled the HD2 (display model) tonight at Radio Shack. Ugggggh, that thing looks sweet, and could be the only thing leaving doubts. It's what we begged Palm for 5 years ago. Oops. Mexican, not Aussie. That was the HD2 on ATT I was looking into. ATT also said that they would be releasing iPhone tethering "in the coming months" too. A year in and still waiting. My bet is that "coming months" = Never. By the time AT&T "gets ready to sell it", Palm will already be dead and iphone rev 4 will be out. Anyone else think the 'post' dosent exist? If there were a new Palm model in the pipeline, that "Flagship" specced phone everyone is saying they need, then now would be a REALLY GOOD time for people to drop hints about it. Before webOS, when people were bringing out the coffin for Palm, Palm's annoubcements were full of "working on next generation platforms and devices" type statements. RE: Anyone else think the 'post' dosent exist? I beg to differ. Give ATT at least thirty days before Palm "leaks" (errrr, trys to stop the leaks) those world famous blurry cam spy photos. That will give time for the new carrier to have its party without the ODM stealing their thunder. Yeah, they (we) need some juicy gossip of upcoming glory around here. I expect some 4G action.